Vision starts in the retina, the part of the eye that translates light into electrical signals for the brain. When cells in the retina get damaged, they never heal or grow back. It’s a devastating fact for the millions who have lost sight due to traumatic injuries or diseases like macular degeneration, retinitis or diabetic retinopathy. But some species, such as fish and birds, shrug off injury to the eye. Unlike mammals, they can regenerate their retina. Scientists think these animals hold the clues for people to one day do the same. During the past decade, scientists have learned a tremendous amount about how these animals are able to restore retinal nerve cells, according to Dr. Tom Reh, University of Washington professor of biological structure. Scientists at his lab and elsewhere are trying to spur the same retinal repair in mammals. Reh is a UW Medicine researcher at the Institute for Stem Cell and Regenerative Medicine. Another view of regenerated neurons (green) in very young mice. We’re a long way off, Reh said. Still, researchers have coaxed the retinal cells of mice into creating new neurons—the first step on the road to regeneration. So there’s hope scientists could someday do the same in the human retina. But first, back to birds and fish. The process of regeneration in these animals revolves around a single type of cell in the retina called Muller glia. The everyday function of the glia is to provide structural support. When injury occurs, glial cells are “reprogrammed” and revert back to an immature state. Essentially, they travel back in developmental time and start over as neural stem cells. 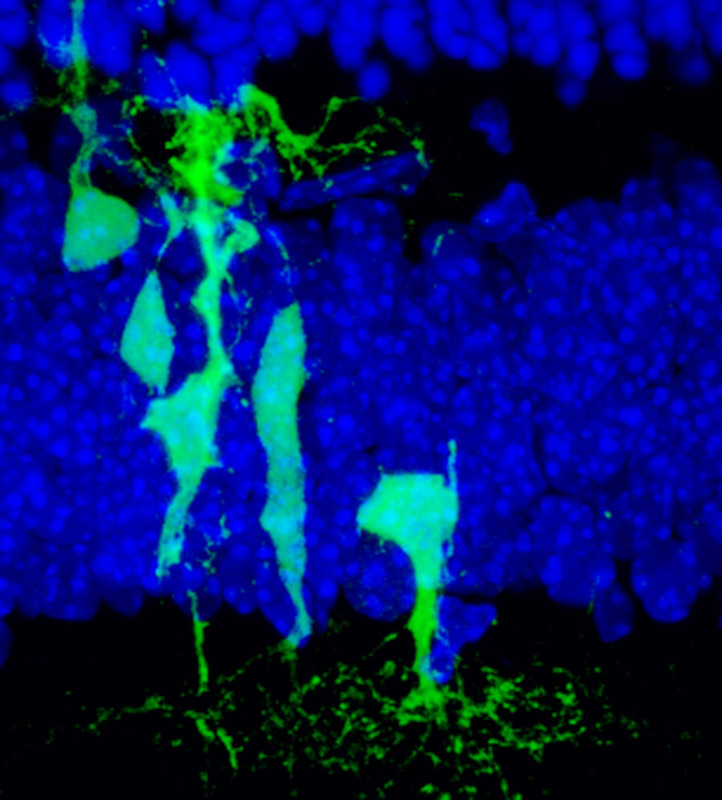 Instead of developing back into glial cells, though, they make new retinal neurons. The signal that tells these cells to reprogram remains a mystery; scientists don’t know the exact molecular mechanism for regeneration. In 2001, a researcher in Reh’s lab identified a particular gene called ACSL1 that seemed to be involved in the process in birds. This finding was later confirmed in fish as well. Typically, ASCL1 is turned off in glial cells. Within an hour of injury, it’s active. Over the next week or two the glia that make ASCL1 produce many new neurons to replace the defunct ones. And vision returns. Muller glial cells are also present in mammals, including humans. In 2013, a grad student in Reh’s lab, Julia Pollak, was able to turn on ASCL1 in a culture of mouse glial cells. They morphed into a state closely resembling neural stem cells. Encouraged, Reh’s lab tried again in live mice. They flipped on the ASCL1 gene in mice that had had a retinal injury. The glia cells again shifted to a stem cell-like state and repaired some of the damage. Nevertheless, there were two caveats: the regeneration happened only in mice younger than two weeks, and they could produce only inner retinal neurons, not the outer rods and cones that are lost in macular degeneration. Matthew Wilken, a postdoc in Reh’s lab, believes that a genetic on-off switch is the key to understanding why. A quick genomic refresher: Nearly every one of your cells contains a copy of your genome, the recipe book for building every cell, organ and tissue in your body. Different parts of the genome are active in each cell; that’s why one ends up as a skin cell and another as a liver cell. A cell’s epigenetic state refers to which genes are turned on or off. Leah Vandenbosch, a graduate student in Reh’s lab, is exploring the nitty gritty of the epigenomic landscape. She hopes to understand what happens as mice mature and the Ascl1 gene no longer triggers a change in glia cells. Meanwhile, Wilken recently identified a promising new compound that, when added to glia cells in a Petri dish along with Ascl1, coax them a bit further down the developmental road. Another grad student, Nik Jorstad, is having some success with this new compound in live mice as well. The quest to regenerate the retina continues. Reh has been working on the problem ever since the early 1970s, after picking up a book that said the eye was like the brain in miniature.